Monks, as the name suggests, are solitary sorts who enjoy keeping to themselves. And yet, I think it is safe to say that monks do not suffer extensively from loneliness. 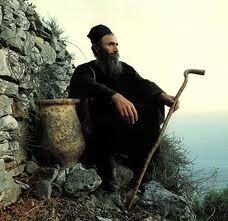 Still, it is not unusual for monks, especially hermits, to be asked if they are lonely. It would appear to be a perfectly natural question from outside of monasticism, but within the cloister walls it sounds strange indeed. When Saint Herman of Alaska was asked if he felt lonely on Spruce Island, he replied, “No, I am not alone there. God is there, as God is everywhere.” His answer suggests not only a qualitative difference in sensitivity to God’s presence on the part of the old monk, but also the fulfillment of a deeper purpose in the Saint’s presence on a cold, lonely island off the Gulf of Alaska. Referring to Christ’s frequent retreats into the wilderness, Saint John Chrysostom wrote, “For what purpose does He go up into the mountain? To teach us, that loneliness and solitude are good, when we use them to pray to God.” (Commentary on Matthew, 50.1 PG 58.503, [translation mine]). Taking into account contemporary psychological theories of loneliness, one can also understand the disconnect between the world of the monk and those who wonder at his purportedly lonely life. Peplau and Perlman (1982) defined loneliness as a negative emotional response to a discrepancy between desired and achieved levels of social contact. A monk desires “social contact” with God and His saints. Through the divine services and solitary prayer, the monk is given ample opportunities to make that living contact on not just a daily basis, but even on a moment-to-moment basis. And for those who reach the state of unceasing prayer, that most blessed contact continues even during sleep, so like the writer of the Song of Songs, the monk chants, “I sleep, but my heart waketh.” (Song 5:2) So it stands to reason, that monks would not feel lonely, even if they rarely encounter a single visitor during the day. They are in fact entertaining guests all the time. “Some have even entertained angels unawares” (Hebrews 13:2). « More on Thoughts. . .